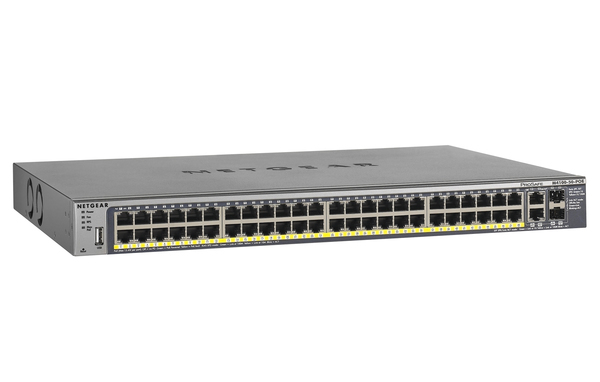 The NETGEAR Intelligent Edge M4100 series consists of 12 fully managed switches, ranging from 8-port Fast Ethernet to 50-port Gigabit Ethernet. They are ideal for all organizations considering reliable, affordable and simple access layer switching with CLI, advanced scripting capabilities and Layer 3 routing. As a cost-effective component of converged voice, video and data networking solutions, NETGEAR M4100 series delivers a secure edge in commercial buildings and campus LAN environments: PoE (802.3af) and PoE+ (802.3at) versions of M4100 series are perfect for Wireless access points, IP telephony and IP surveillance deployments.